Geodes are one of the exciting secrets of nature: a round rock that looks ordinary until it is split open to reveal beautiful quartz crystals in a cavity within. Because geodes look ordinary from the outside, a seeker needs to know what to look for while the crystals are still hidden. 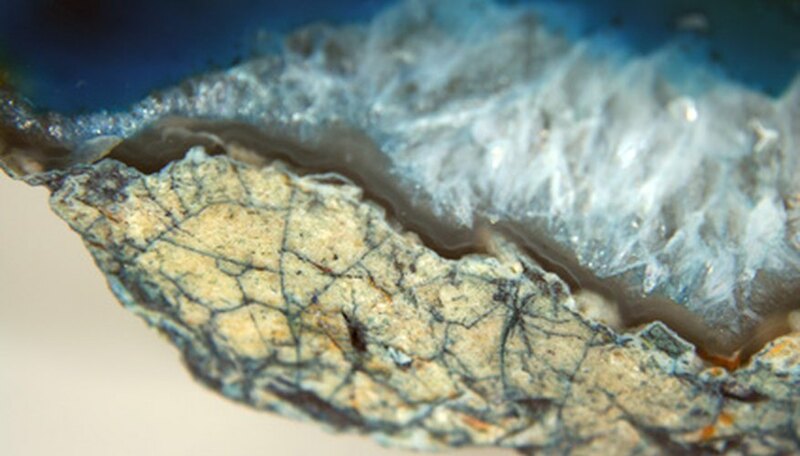 The only way to be absolutely certain that a rock is a geode is to open it up, but there are signs that help identify whole geodes. Look for small rocks that are unusually round. Although geodes can be smaller than 1 inch or larger than 2 feet, the average size is between 2 and 6 inches in diameter. The round shape can be a clue about the inner cavity that allows the crystals to form. Look for a lumpy surface that somewhat resembles cauliflower. Shake the rock. Sometimes crystals within the geode break loose and rattle when shaken. Break open the geode using a hammer, geode cracker or rock saw, or take it to a rock shop to be cut open. To get the smallest chance of damage to the geode, use a geode cracker, which has a greater degree of operator control. If using a hammer, smash the geode carefully to reduce the chances of damage to the interior chamber and the crystals it holds. If using a rock saw, be alert for pieces of crystal coming loose that can damage the saw blade. Search in an area where collecting is acceptable. Many geode-rich areas are on private property where permission must be obtained. Also, removing geodes from state or national parks is illegal. Wear safety glasses when breaking open geodes, especially if using a hammer. Pieces can break off in unpredictable ways. Elizabeth Shively Wages is a librarian in Fort Wayne, Ind. She attained her undergraduate degree in social work from Manchester College and her master's degree in library science from Indiana University. Her work experience includes social service nonprofit agencies in the United States and Europe. Shively Wages started writing professionally in 2009, and has articles published on Answerbag and eHow.